hi to all in forum, i bought a c-20 a few months ago . first let me say i am a complete rookie when it comes to sailing but grew up around power boats. i am currently rebedding all hardware, installing new motor bracket, working on rudder issues. hope to finish the boat soon and get it in the water but the rain has been slowing me down. i have enjoyed reading the posts and hope to learn alot. Welcome again and post pictures! Welcome aboard ! I've only seen a few C20's here and there on the web, which to me makes a very desireable find ! I own a C-20, purchased this spring. I live outside Detroit. Had a few issues with the drop keel however its now working and Im sailing again. Thanks Woody, What kind of problems did you have with the keel? I know I need to replace the cable before I take it out. I just ordered a new main but thanks for the offer. I also purchased the boat this spring and thought I would have it in the water by now ,but we have had the wettest summer on record this year in south tx and I'm not making good time on the repairs. I will try to post some pics soon. I'm just few hours east of you, and you guys have really been soaked over there. Usually it rains on you then moves to me, but this year it has just hung over you. weldon wrote: Thanks Woody, What kind of problems did you have with the keel? I know I need to replace the cable before I take it out. I just ordered a new main but thanks for the offer. I also purchased the boat this spring and thought I would have it in the water by now ,but we have had the wettest summer on record this year in south tx and I'm not making good time on the repairs. I will try to post some pics soon. up against the wood block that holds the pully bracket which caused the wood to rot and kaboom!. So after much fiberglass repair and some inginuity with wood blocking, bigger bolts,etc., Im sailing again!! Its not the best desiign, the original so I improved it. Amazingly the winch seems to work with a little less effort. As far as your cable goes there was some discussion on the board regarding stainless steel vs. line for replacement. I have no clue as th the weight of the keel, best guess 2 -300 lbs? My way of thinking is stick with the stainless steel, wont rot over time.Of I can be of more assitance, give me a whistle. Got to go the wind is blowing!! Re: anyone sailing a c-20 ? Weldon, how is your C_20 sailing? I tried to buy a c-20 in Arizona, but the owner was saving it for his son. If you don't mind telling, how much did you pay for your C-20? Not yet, but soon. Hi from Land Between the Lakes. Just brought home a C-20 from Missouri last Tuesday. Kind of a barn find, previous owner had a relatively new Hunter 26 and had parked the C-20. 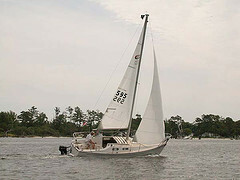 It is a 79 with a main and jib in really good shape and a fine crisp 2 year old 130. So far the hull has power washed up nicely, the interior cushions were physically in decent shape but zippers rusted and smelled of mouse urine, so they have been trashed. Lots of mud daubers were removed. I have disconnected all the standing rigging, from the hull in preparation for lifting the mast off onto saw horses in order to leave the cockpit and cabin unobstructed. ( I used to be known for getting tangled in camo netting). This is necessitated by having to float the hull off in order to rebuild a keel guide on the trailer, and a desire to check all the attach points of the stays to the mast, and hull. The halyards need a good cleaning as well. I will be interested to get the canvas on and a fair wind. Might ask for some pointers on use of the drop keel. Proposed name, Carpe Silentium. Hope to give you some feedback in less than a week. Boxy.